When I prepared betel leaves rice for the first time, I got very positive feedback and it soon occupied a regular place in our menu. Easy availability of the betel leaves is one of the reason behind the popularity of this dish at our home. Last time when I prepared this rice, I was left with few betel leaves and I stored them for making vada . This one is also from Karasaram reva's site. But the leaves turned slightly darker in its colour which don't look like edible. so, I just discarded the leaves and forget about making the vadas. When my mom returned from my relative's marriage, she got few fresh betel leaves. In India, betel leaves are given with coconut, banana and kumkum as thampoolam in marriages and other rituals. On seeing the betel leaves the idea of making the betel leaf vada came into my mind again. I stored betel leaves in refrigerator to keep it fresh and soaked whole moong dal for 6-7 hours. After taking one cup of soaked moong dal for making the vada, I used the remaining moong dal to make sprouts. This betel leaf vada can be used as a evening snack and I served it with sweet and spicy tamarind chutney. 1) Take cooked rice in a wide bowl. Mush it well using your hand or spatula. 2) Make a coarse paste of soaked moong dal using a mixer without adding water. Add this coarse paste to the mushy rice. 3) Grind the ginger and green chillies to a coarse paste. Add it to the rice and moong dal mixture. 4) Add other ingredients (betel leaves, curry leaves, coriander leaves, sesame seeds, fenugreek seeds, cumin seeds and salt). Mix well until all the ingredients are well incorporated. No need to add water. 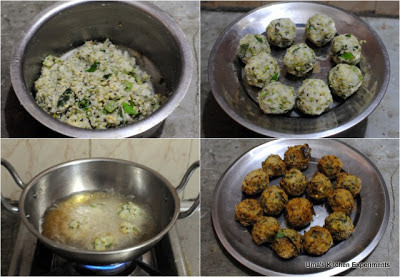 5) Shape this mixture into a round shape vada (with a size of an amla) and arrange in plates. 6) Heat oil in a frying pan. when it is hot and not smoking, fry the vadas till the outer part becomes crisp and turns golden brown. 7) Serve hot. We enjoyed it with sweet and spicy tamarind chutney. 1) Use only mid range betel leaves. It should not be too young and too mature. If you don't get such mid range leaves, use whatever you get, but make sure to adjust the count based on its size and maturity. 2) The original recipe includes white sesame seeds, fenugreek powder and cumin powder. As I didn't have these ingredients, I chose to add black sesame seeds, fenugreek seeds and cumin seeds. so yummy and tempting snack! awesome recipe.. i hv beetel leaves grown in my house.. wld love to try it.. my hubby wants me to try it for sure wen i sd abt tis one..
liked all ur clicks uma.. thanks for sharing this recipe.. will try it..
sounds very interesting,thxs for sharing!! Seriously this vadas are in my to do list since a long, we dont get betel leaves here..Fabulous vadas.